The diagnosis of cerebral small vessel disease (SVD) is difficult because there is no consensus on clinical criteria and therefore, imaging is important for diagnosis. Most patients undergo brain imaging by computed tomography (CT), which is able to detect ischemic strokes, hemorrhages and brain atrophy and may also indicate white matter changes. Magnetic resonance imaging (MRI) remains the key neuroimaging modality and is preferred to CT in vascular cognitive impairment (VCI) because it has higher sensitivity and specificity for detecting pathological changes. These modalities for imaging morphology permit to detect vascular lesions traditionally attributed to VCI in subcortical areas of the brain, single infarction or lacunes in strategic areas (thalamus or angular gyrus), or large cortical-subcortical lesions reaching a critical threshold of tissue loss. In SVD multiple punctuate or confluent lesions can be seen in the white matter by MRI and were called leukoaraiosis. Another major neuroimaging finding of small vessel disease in VCI are microhemorrhages. However, while CT and MRI are able to detect morphologic lesions, these modalities cannot determine functional consequences of the underlying pathological changes. Positron emission tomography (PET) can support the clinical diagnosis by visualizing cerebral functions in typically affected brain regions. In SVD, Fluor-Deoxy-Glucose (FDG)-PET can clearly differentiate scattered areas of focal cortical and subcortical hypometabolism that differ from the typical metabolic pattern seen in Alzheimer Dementia (AD) with marked hypometabolism affecting the association areas. Additional PET tracers can further support the diagnosis of a type of dementia and also yield information on the underlying pathophysiology. Vascular etiologies are among the most common causes of dementia, but the numbers vary considerably according to the different criteria used for vascular cognitive impairment (VCI)1, 2. In the Rochester Epidemiology Project of 419 old demented patients, the post mortem diagnosis of AD was established in 51 %, of pure vascular dementia in 13 %, and of mixed vascular-Alzheimer dementia in 12 % of patients, with “other” diagnosis in the remaining patients3. According to a controlled neuropathological study, pure vascular dementia (VaD) is responsible for 8–10 %, Alzheimer’s disease (AD) for 60–70 %, and dementia with Lewy bodies (DLB) for 10–25 % of dementia cases4, 5, Furthermore, it is evident from autopsy studies that many patients have mixed dementias6, often vascular disease with other conditions5. Old criteria for VaD only included multi-infarct dementia7 or dementia resulting from the cumulative effects of several clinically significant strokes, but the current criteria consider multi-infarct dementia as only one of several subtypes of VaD, including single-stroke dementia and small vessel disease. The three main neuroimaging patterns in VaD are large vessels strokes (macroangiopathy, arteriosclerosis), small vessel disease (microangiopathy, arteriolosclerosis), and microhemorrhages. Single large territorial strokes, especially in the middle cerebral artery (MCA) territory of the dominant hemisphere, or multiple smaller strokes in bilateral anterior cerebral artery (ACA) or posterior cerebral artery (PCA) territories, cause dementia in ∼30% of stroke survivors5, 8. Single smaller strokes can also cause significant cognitive dysfunction when occurring in particular locations, such as the watershed territories, including the bilateral superior frontal gyrus or bilateral orbitofrontal (ACA/MCA), angular gyrus (ACA/MCA/PCA), temporo-occipital junction, and inferior temporal gyrus (MCA/PCA)9. Cerebral small vessel disease (SVD) is a condition resulting from damage to the cerebral microcirculation. It causes incomplete or complete infarcts in the white matter or in subcortical gray matter nuclei10-13, that are usually clinically `silent´. Advanced SVD is characterized by white matter hyperintensities (WMH), enlarged perivascular spaces (PVS), lacunes, microbleeds and cerebral atrophy14. These abnormalities are seen in up to 10% of persons in the 7th decade and in above 85% in their 9th decade. Lacunes must be differentiated from perivascular Virchow-Robin spaces. Lacunar strokes are small complete infarcts (2 to 15 mm)15, 16. When located in the caudate head, anterior thalamus, or the mamillothalamic tract17 lacunae can cause significant cognitive and/or behavioral dysfunction due to the extended functional deafferentation of the cortical areas. Since clinical signs and symptoms are often insufficient to allow for a final diagnosis and usually cannot differentiate among the various etiologies, neuroimaging plays an important role in the management of patients with impaired cognition. Neuroimaging is also relevant for the detection of sporadic SVD18. This review will concentrate on the importance of imaging procedures for the diagnosis of SVD as a cause of VCI. Additionally, it will describe the value of molecular and functional imaging for the detection of the relationship of morphological damage and cognitive impairment and of the differentiation between vascular and degenerative causes of dementia. Neuroimaging provides important information on neuroanatomical substrate of the disorder, plays an important role in the diagnosis and adds to prediction of VaD. Most acute stroke patients undergo computed tomography (CT) brain imaging; thus studies using CT are representative of the whole clinical population. In clinical practice, CT is performed primarily to exclude haemorrhage and some stroke mimics (such as brain tumours), and can often demonstrate early signs of ischaemia (e.g. swelling, hypodensity and hyperdense vessels) and old stroke lesions. Furthermore, the presence and severity of white matter lesions (WMLs) and brain atrophy can also be readily determined from CT brain scans - features which may predict subsequent cognitive impairment and dementia. There is a very good agreement between brain atrophy and presence of moderate-severe white matter lesions on CT and MRI measures19, 20. Magnetic resonance imaging (MRI) remains the key neuroimaging modality in VaD (review in21, 22). If not contraindicated, MRI, rather than CT, is preferred for research and routine clinical use because it has higher sensitivity and specificity for detecting pathological changes23. Standards for neuroimaging with a widely accepted terminology permitting comparison of findings between centers have been recommended (STandards for ReportIng Vascular changes on Neuroimaging, STRIVE)24. Numerous studies identified MRI markers of small vessel disease (SVD) (lacunes, white matter hyperintensities, cerebral microbleeds, silent infarcts, white matter changes, global cerebral atrophy, medial-temporal lobe atrophy) as determinants of VaD12, 25-27. Vascular lesions traditionally attributed to VaD comprise subcortical areas of the brain, especially sub-frontal white matter circuits, strategic areas of single infarction such as the dominant thalamus or angular gyrus, deep frontal areas and the left hemisphere, and bilateral brain infarcts or volume-driven cortical-subcortical infarctions reaching a critical threshold of tissue loss or injury5, 28. Recently, enlargements of perivascular spaces were identified as MRI markers of small vessel disease. These are associated with the pathogenesis of vascular-related cognitive impairment in older individuals29. The burden of SVD is increased in systemic lupus erythematosus30 and – as the risk of stroke – in type 2 diabetes31. Small vessel disease identified on MRI in the white matter is called leukoaraiosis32. Leukoaraiosis presents as multiple punctuate or confluent lesions, but more often as incomplete infarcts, and is commonly seen in healthy elderly33 and in subjects with migraine. The markers of small vessel disease - white matter hyperintensities, lacunes, dilated vascular spaces, microbleeds, and brain volume - are related to decrease in regional cerebral blood flow34 and must be clearly defined to be reliably used for the diagnosis of this vascular disorder and its progression25. Some studies have suggested that to assess in single cases how much the lesion load affects cognition, a threshold of 10 cm2 35 or 25% of total white matter36 is required before VaD is detectable clinically. On FLAIR images, incomplete infarcts present as hyperintensities, whereas complete infarcts present as lacunae, which are hypointense in relation to the brain and isointense to the cerebrospinal fluid. Diffusion-weighted MRI is best suited to reveal surrogate markers of SVD progression37. After stroke, medial temporal lobe atrophy is rather related to cognitive impairment than markers of small vessel disease38. When small vessel disease causes subcortical VaD, this is associated with the pathology of Binswanger's disease39. Microhemorrhages are the third major neuroimaging aspect of VaD, and in one study they were found in 65% of VaD cases40. While macrohemorrhages associated with cognitive impairment (e.g., venous infarcts) can be seen on conventional T1- and T2-weighted spin echo images, microhemorrhages often cannot be seen in these sequences, but can be detected accurately using T2*-weighted gradient echo images. In many cases, it is likely that microhemorrhages and white matter ischemic disease are caused by systemic hypertension41. Morphologic imaging indicates the extent and severity of SVD, but the observed changes are not directly related to functional or cognitive impairment and prognosis. In one study42 several MRI findings together with older age and lower gait speed were identified as risk factors associated with mortality. Functional effects of SVD can only be detected by combining morphological imaging with more complex technologies , e.g. magnetic resonance spectroscopy for showing biochemical changes43 and functional MRI for analysis of cortical dysfunction44. Advanced imaging techniques including molecular imaging by positron emission tomography (PET) will help to understand the mechanisms by which SVD causes VCI and will improve diagnostic accuracy; they might reflect disease progression and in the future might be useful for development of therapies45. The diagnosis of vascular cognitive impairment (VCI) is difficult because there is no consensus on clinical criteria. Additionally, cerebral arteriosclerosis frequently is present in elderly patients and even small infarcts or white matter lesions occur in elderly subjects without either cognitive impairment or degenerative dementia. There is a tendency to diagnose VCI on the basis of MRI, which has a high sensitivity for white matter hyperintensities (WMHs), which may be seen in normal elderly as well as those with VCI. Pathological studies reveal a high incidence of both vascular and degenerative pathology of the Alzheimer type. This leads to diagnostic confusion when only the MRI is used, and there is mixed pathologies. PET provides additional information, which increases the diagnostic certainty. Positron emission tomography can support the clinical diagnosis by visualizing cerebral functions in typically affected brain regions. PET of 18F-2-fluoro-2-deoxy-D-glucose (FDG) for measurement of regional cerebral glucose metabolism (rCMRGl) has shown a typical metabolic pattern in patients with probable Alzheimer Disease (AD): hypometabolism in temporoparietal and frontal association areas, but relative recessing of primary cortical areas, basal ganglia and cerebellum46, 47. In VCI a different pattern is seen48: In VCI FDG PET can clearly differentiate scattered areas of focal cortical and subcortical hypometabolism (Fig. 1) that differ from the typical metabolic pattern seen in AD with marked hypometabolism affecting the association areas49. 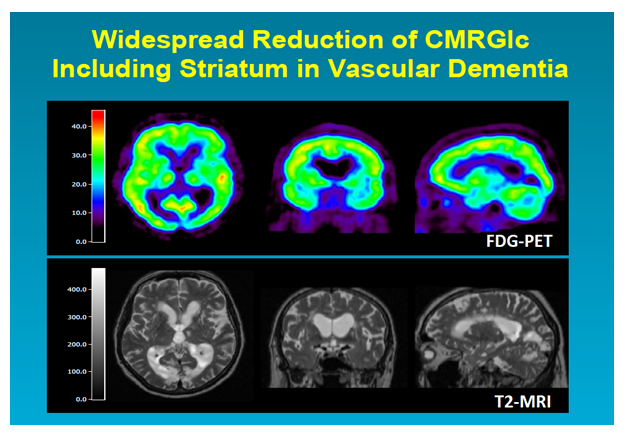 In VaD patients50 a significant reduction of rCMRglc in comparison to normal patients was observed in widespread cerebral regions (middle frontal cortex, temporoparietal cortex, basal ganglia, cerebellum and brainstem). In subcortical areas and primary sensorimotor cortex this hypometabolism was more marked than in AD while the association areas were less affected than in AD. A metabolic ratio (rCMRglc of association areas divided by rCMRglc of primary areas, basal ganglia, cerebellum and brainstem) mainly reflecting the contrast between association areas and subcortical regions was significantly lower in AD than in VCI51. Whereas it was not possible to identify a single region that could discriminate between VCI and AD, the composite pattern, as expressed in the metabolic ratio, was significantly different. Considering that the VCI patients in that study had mainly WMHs and small subcortical infarcts, it suggests furthermore that even small infarcts in combination with WMHs may contribute to cognitive decline. Rather than the total volume of infarction, the volume of functional tissue loss is more important, since it also includes the effects of incompletely infarcted tissue and morphologically intact but deafferented cortex (Fig. 2). Subcortical ischemic vascular disease (SIVD) can be distinguished from clinically probable AD by a more diffuse pattern of hypometabolism involving also the primary cortices, basal ganglia, thalamus and cerebellum. Figure 2: T1 and T2-weighted MRI and PET images in VCI caused by multiple small infarcts, lacunes and widespread white matter changes. The PET images show diffuse impairment of metabolism in both hemispheres and also in basal ganglia, thalamus and cerebellum (Copyright W.-D. Heiss, MPI Cologne). Alzheimer's disease (AD) is characterized by regional impairment of cerebral glucose metabolism in neocortical association areas, whereas the primary visual and sensorimotor cortex, basal ganglia, and cerebellum are relatively well preserved52. In a multicentre study comprising 10 PET centers that employed an automated voxel-based analysis of FDG PET images, the distinction between controls and AD patients had 93% sensitivity and 93% specificity53. Significantly abnormal metabolism in mild cognitive impairment (MCI) indicates a high risk to develop dementia within the next two years. Reduced neocortical glucose metabolism can probably be detected with FDG PET in AD on average one year before onset of subjective cognitive impairment54, 55. Characteristic patterns of regional hypometabolism are also seen in other degenerative dementias56-60. Frontotemporal dementia (FTD) clinically characterized by changes in personality and behavior, semantic deficits and progressive aphasia can be identified by distinct frontal or frontotemporal metabolic impairments that are typically quite asymmetrically centered in the frontolateral cortex and the anterior pole of the temporal lobe. Dementia with Lewy bodies (LBD)61, combining fluctuating consciousness, Parkinsonian symptoms and impairment of visual perception including hallucinations, shows reduction of glucose metabolism in primary visual cortex in addition to that in posterior association areas. Other degenerative disorders show typical hypometabolism in the specifically affected brain structures: the putamen and cortex in corticobasal degeneration62, the caudate nucleus in Huntington's chorea63, the frontal cortex and midbrain in progressive supranuclear palsy64, pons and cerebellum in olivopontocerebellar atrophy65. It is also important to note that depressive disorders may mimic cognitive impairment; in these cases glucose metabolism does not show regional abnormalities. Additional PET tracers can further support the diagnosis of a type of dementia and also yield information on the underlying pathophysiology: Tracers permit the study of selectively affected transmitter / receptor systems, e.g. the cholinergic system in AD - significant reduction of cholinergic activity in the cortex of AD patients and those with MCI and early conversion to AD66 - or the dopaminergic system in LBD67 and the detection of pathogenetic depositions, e.g. amyloid and tau in AD68 or inflammatory reactions with microglia activations as in VCI. Especially the imaging of accumulation of pathologic proteins is a recent strategy to differentiate degenerative dementias: Amyloid is a pathogenetic product in the development of AD and its accumulation is a key finding in this disease. Its accumulation can be imaged by 11C labeled Pittsburgh Compound B (PiB)69 or by several newer 18F labeled tracers70. Whereas only small amounts of amyloid can be detected in the white matter in normal aging71, accumulation is visible in the frontal and temporo-parietal cortex in AD and MCI72. However, also in 20-30% of aged persons without relevant cognitive impairment an increased accumulation of amyloid can be detected73, and the grade of amyloid deposition as detected by PET is not related to the severity of cognitive impairment74. That means that amyloid might be deposited in the brain eventually long before cognitive impairment is recognized. Amyloid deposition in combination with neuroinflammation as expressed in microglia activation might play a role in the development of post-stroke dementia75. A more specific pathologic protein produced in AD is tau, and its deposition in the mesial temporal lobe is an early marker of AD or MCI76 and the amount of tau detected in the cortex by selective PET-tracers is related to the severity of cognitive impairment77. These PET-tracers also detect the primary pathological substrate in other degenerative dementias (e.g. tau in FTD)78 and permit the differentiation between AD and VCI and other degenerative dementias79-82. 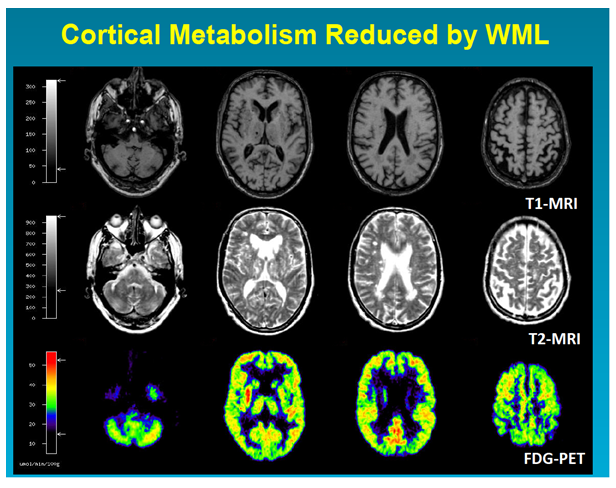 The unique potentials of PET in localizing and quantifying metabolic changes in gray matter structures responsible for functional/cognitive disturbances and caused by SVD mainly affecting the white matter makes this technique the preferred tool for studying patients with VCI; the additional ability of PET to detect pathologic proteins (amyloid and tau), to image synaptic transmission and receptor activity is of special value for the differential diagnosis of different types of dementia. All together PET studies may shed light into the pathophysiological mechanisms responsible for the disease in a single patient, repeated investigations in the course may reflect progression and may help to demonstrate efficiency in the development of new treatment strategies. However, due to the scarcity of complete PET installations including cyclotron and radiochemistry, PET is mainly restricted to applications in research. With the installation of more clinical PET cameras as satellites to a central FDG producing unit - a concept, which is already successful for imaging in oncology - more patients with mild cognitive impairment could benefit from improved diagnostic imaging. Small vessel disease (SVD) denotes a group of diseases that affect the small vessels of the brain, mostly due to chronic hypertensive damage to small arteries and arterioles. The diagnosis of SVD is difficult because there is no consensus on clinical criteria. Clinical manifestations include cognitive impairment and emotional disturbances. The initially observed mild neurocognitive disorder usually is progressive and affects other domains such as sensorimotor functions, coordination, language and memory. Over time it can result in vascular dementia. SVD is more frequent than previously thought and can now be better detected due to progress in neuroimaging. In acute cerebrovascular disease, computed tomography is the first imaging procedure, as it can detect ischemic strokes, hemorrhages and brain atrophy and may also indicate white matter changes. MRI remains the key neuroimaging modality in chronic vascular cognitive impairment (VCI) because it has higher sensitivity and specificity for detecting pathological changes. It permits to detect vascular lesions traditionally attributed to SVD in subcortical areas of the brain, lacunes in strategic areas (thalamus or angular gyrus). Multiple punctuates or confluent lesions can be seen in the white matter by MRI and are called leukoaraiosis. Another major neuroimaging finding of small vessel disease in VCI are microhemorrhages. However, while computed tomography and magnetic resonance imaging are able to detect morphologic lesions, these modalities cannot determine functional consequences of the underlying pathological changes, which can be detected and quantitatively assessed by PET. Additionally, pathological studies reveal a high incidence of mixed dementias with both vascular and degenerative pathology of the Alzheimer type. This leads to diagnostic confusion when only MRI is used. That means that molecular imaging by PET may play an important role in the differentiation of vascular and degenerative cognitive impairment. Rockwood K, Wentzel C, Hachinski V, et al. Prevalence and outcomes of vascular cognitive impairment. Vascular Cognitive Impairment Investigators of the Canadian Study of Health and Aging. Neurology. 2000; 54: 447-451. De Reuck J, Deramecourt V, Cordonnier C, et al. The incidence of post-mortem neurodegenerative and cerebrovascular pathology in mixed dementia. J Neurol Sci. 2016; 366: 164-166. Knopman DS, Parisi JE, Boeve BF, et al. Vascular dementia in a population-based autopsy study. Arch Neurol. 2003; 60: 569-575. Jellinger KA, Attems J. Neuropathological evaluation of mixed dementia. J Neurol Sci. 2007; 257: 80-87. Jellinger KA. The enigma of vascular cognitive disorder and vascular dementia. Acta Neuropathol. 2007; 113: 349-388. Korczyn AD. Mixed dementia--the most common cause of dementia. Ann N Y Acad Sci. 2002;977:129-134. Hachinski V, Iliff LD, Zilkha E, et al. Cerebral blood flow in dementia. ArchNeurol. 1975; 32: 632-637. Guermazi A, Miaux Y, Rovira-Canellas A, et al. Neuroradiological findings in vascular dementia. Neuroradiology. 2007; 49: 1-22. Pohjasvaara T, Mantyla R, Salonen O, et al. MRI correlates of dementia after first clinical ischemic stroke. J Neurol Sci. 2000; 181: 111-117. Roman GC, Erkinjuntti T, Wallin A, et al. Subcortical ischaemic vascular dementia. Lancet Neurology. 2002; 1: 426-436. Wardlaw JM, Smith C, Dichgans M. Mechanisms of sporadic cerebral small vessel disease: insights from neuroimaging. Lancet Neurol. 2013; 12: 483-497. Norrving B. Evolving Concept of Small Vessel Disease through Advanced Brain Imaging. J Stroke. 2015; 17: 94-100. Shi Y, Wardlaw JM. Update on cerebral small vessel disease: a dynamic whole-brain disease. Stroke Vasc Neurol. 2016; 1: 83-92. Blair GW, Hernandez MV, Thrippleton MJ, et al. Advanced Neuroimaging of Cerebral Small Vessel Disease. Curr Treat Options Cardiovasc Med. 2017; 19: 56. Debette S, Markus HS. The clinical importance of white matter hyperintensities on brain magnetic resonance imaging: systematic review and meta-analysis. BMJ. 2010; 341: c3666. Fisher CM. The arterial lesions underlying lacunes. Acta Neuropathol. 1968; 12: 1-15. Carrera E, Bogousslavsky J. The thalamus and behavior: effects of anatomically distinct strokes. Neurology. 2006; 66: 1817-1823. Charidimou A, Pantoni L, Love S. The concept of sporadic cerebral small vessel disease: A road map on key definitions and current concepts. Int J Stroke. 2016; 11: 6-18. Wattjes MP, Henneman WJ, van der Flier WM, et al. Diagnostic imaging of patients in a memory clinic: comparison of MR imaging and 64-detector row CT. Radiology. 2009; 253: 174-183. Wahlund LO, Barkhof F, Fazekas F, et al. A new rating scale for age-related white matter changes applicable to MRI and CT. Stroke. 2001; 32: 1318-1322. Vitali P, Migliaccio R, Agosta F, et al. Vessel Disease With MRI. Stroke. 2017; 48: 3175-3182. Brainin M, Tuomilehto J, Heiss WD, et al. Post-stroke cognitive decline: an update and perspectives for clinical research. Eur J Neurol. 2015; 22: 229-238, e213-226. Wardlaw JM, Smith EE, Biessels GJ, et al. Neuroimaging standards for research into small vessel disease and its contribution to ageing and neurodegeneration. Lancet Neurol. 2013; 12: 822-838. De Guio F, Jouvent E, Biessels GJ, et al. Reproducibility and variability of quantitative magnetic resonance imaging markers in cerebral small vessel disease. J Cereb Blood Flow Metab. 2016; 36: 1319-1337. Salamon N. Neuroimaging of cerebral small vessel disease. Brain Pathol. 2014; 24: 519-524. Shibuya M, Leite CDC, Lucato LT. Neuroimaging in cerebral small vessel disease: Update and new concepts. Dement Neuropsychol. 2017; 11: 336-342. Peres R, De Guio F, Chabriat H, et al. Alterations of the cerebral cortex in sporadic small vessel disease: A systematic review of in vivo MRI data. J Cereb Blood Flow Metab. 2016; 36: 681-695. Ding J, Sigurethsson S, Jonsson PV, et al. Large Perivascular Spaces Visible on Magnetic Resonance Imaging, Cerebral Small Vessel Disease Progression, and Risk of Dementia: The Age, Gene/Environment Susceptibility-Reykjavik Study. JAMA Neurol. 2017; 74: 1105-1112. Wiseman SJ, Bastin ME, Jardine CL, et al. Cerebral Small Vessel Disease Burden Is Increased in Systemic Lupus Erythematosus. Stroke. 2016; 47: 2722-2728. Umemura T, Kawamura T, Hotta N. Pathogenesis and neuroimaging of cerebral large and small vessel disease in type 2 diabetes: A possible link between cerebral and retinal microvascular abnormalities. J Diabetes Investig. 2017; 8: 134-148. Hachinski VC, Potter P, Merskey H. Leuko-araiosis. ArchNeurol. 1987; 44: 21-23.
de Leeuw FE, de Groot JC, Achten E, et al. Prevalence of cerebral white matter lesions in elderly people: a population based magnetic resonance imaging study. The Rotterdam Scan Study. J Neurol Neurosurg Psychiatry. 2001; 70: 9-14. Shi Y, Thrippleton MJ, Makin SD, et al. Cerebral blood flow in small vessel disease: A systematic review and meta-analysis. J Cereb Blood Flow Metab. 2016; 36: 1653-1667. Boone KB, Miller BL, Lesser IM, et al. Neuropsychological correlates of white-matter lesions in healthy elderly subjects. A threshold effect. Arch Neurol. 1992; 49: 549-554.
van Straaten EC, Scheltens P, Knol DL, et al. Operational definitions for the NINDS-AIREN criteria for vascular dementia: an interobserver study. Stroke. 2003; 34: 1907-1912. Lyoubi-Idrissi AL, Jouvent E, Poupon C, et al. Diffusion magnetic resonance imaging in cerebral small vessel disease. Rev Neurol (Paris). 2017; 173: 201-210. Arba F, Quinn T, Hankey GJ, et al. Cerebral small vessel disease, medial temporal lobe atrophy and cognitive status in patients with ischaemic stroke and transient ischaemic attack. Eur J Neurol. 2017; 24: 276-282. Roman GC. Senile dementia of the Binswanger type. A vascular form of dementia in the elderly. JAMA. 1987; 258: 1782-1788. Cordonnier C, van der Flier WM, Sluimer JD, et al. Prevalence and severity of microbleeds in a memory clinic setting. Neurology. 2006; 66: 1356-1360. Koennecke HC. Cerebral microbleeds on MRI: prevalence, associations, and potential clinical implications. Neurology. 2006; 66: 165-171.
van der Holst HM, van Uden IW, Tuladhar AM, et al. Factors Associated With 8-Year Mortality in Older Patients With Cerebral Small Vessel Disease: The Radboud University Nijmegen Diffusion Tensor and Magnetic Resonance Cohort (RUN DMC) Study. JAMA Neurol. 2016; 73: 402-409. Sappey-Marinier D, Calabrese G, Hetherington HP, et al. Proton magnetic resonance spectroscopy of human brain: applications to normal white matter, chronic infarction, and MRI white matter signal hyperintensities. Magnetic Resonance in Medicine. 1992; 26: 313-327. Schaefer A, Quinque EM, Kipping JA, et al. Early small vessel disease affects frontoparietal and cerebellar hubs in close correlation with clinical symptoms--a resting-state fMRI study. J Cereb Blood Flow Metab. 2014; 34: 1091-1095. Banerjee G, Wilson D, Jager HR, et al. Novel imaging techniques in cerebral small vessel diseases and vascular cognitive impairment. Biochim Biophys Acta. 2016; 1862: 926-938. Foster NL, Chase TN, Mansi L, et al. Cortical abnormalities in Alzheimer's disease. AnnNeurol. 1984; 16: 649-654. Minoshima S, Giordani B, Berent S, et al. Metabolic reduction in the posterior cingulate cortex in very early Alzheimer's disease. Ann Neurol. 1997; 42: 85-94. Heiss WD, Zimmermann-Meinzingen S. PET imaging in the differential diagnosis of vascular dementia. J Neurol Sci. 2012; 322: 268-273. Benson DF, Kuhl DE, Hawkins RA, et al. The fluorodeoxyglucose 18F scan in Alzheimer's disease and multi-infarct dementia. Arch Neurol. 1983; 40: 711-714. Mielke R, Herholz K, Grond M, et al. Severity of vascular dementia is related to volume of metabolically impaired tissue. Archives of Neurology. 1992; 49: 909-913. Mielke R, Heiss WD. Positron emission tomography for diagnosis of Alzheimer's disease and vascular dementia. JNeural TransmSuppl. 1998; 53: 237-250. Herholz K. PET studies in dementia. Ann Nucl Med. 2003; 17: 79-89. Herholz K, Salmon E, Perani D, et al. Discrimination between Alzheimer dementia and controls by automated analysis of multicenter FDG PET. Neuroimage. 2002; 17: 302-326. Herholz K, Nordberg A, Salmon E, et al. Impairment of neocortical metabolism predicts progression in Alzheimer's disease. DementGeriatrCognDisord. 1999; 10: 494-504. Chetelat G, Desgranges B, de lSV, et al. Mild cognitive impairment: Can FDG-PET predict who is to rapidly convert to Alzheimer's disease. Neurology. 2003; 60: 1374-1377. Bohnen NI, Djang DS, Herholz K, et al. Effectiveness and safety of 18F-FDG PET in the evaluation of dementia: a review of the recent literature. J Nucl Med. 2012; 53: 59-71. Duara R, Barker W, Luis CA. Frontotemporal dementia and Alzheimer's disease: differential diagnosis. Dement Geriatr Cogn Disord. 1999; 10 Suppl 1: 37-42. Herholz K, Carter SF, Jones M. Positron emission tomography imaging in dementia. Br J Radiol. 2007; 80 Spec No 2: S160-167. Tripathi M, Tripathi M, Damle N, et al. Differential diagnosis of neurodegenerative dementias using metabolic phenotypes on F-18 FDG PET/CT. Neuroradiol J. 2014; 27: 13-21. Ishii K. PET approaches for diagnosis of dementia. AJNR Am J Neuroradiol. 2014; 35: 2030-2038. Bohnen NI, Muller M, Frey KA. Molecular Imaging and Updated Diagnostic Criteria in Lewy Body Dementias. Curr Neurol Neurosci Rep. 2017; 17: 73. Murgai AA, Jog MS. Neurophysiology and neurochemistry of corticobasal syndrome. J Neurol. 2018. Ciarmiello A, Giovacchini G, Giovannini E, et al. Molecular Imaging of Huntington's Disease. J Cell Physiol. 2017;232:1988-1993. Whitwell JL, Hoglinger GU, Antonini A, et al. Radiological biomarkers for diagnosis in PSP: Where are we and where do we need to be? Mov Disord. 2017; 32: 955-971. Gilman S. Functional imaging with positron emission tomography in multiple system atrophy. J Neural Transm (Vienna). 2005; 112: 1647-1655. Herholz K, Weisenbach S, Kalbe E, et al. Cerebral acetylcholine esterase activity in mild cognitive impairment. Neuroreport. 2005;16:1431-1434. Hilker R, Thomas AV, Klein JC, et al. Dementia in Parkinson disease: functional imaging of cholinergic and dopaminergic pathways. Neurology. 2005; 65: 1716-1722. Braak H, Braak E. Neuropathological staging of Alzheimer related changes. Acta Neuropathol. 1991; 82: 239-259. Klunk WE, Engler H, Nordberg A, et al. Imaging brain amyloid in Alzheimer's disease with Pittsburgh Compound-B. AnnNeurol. 2004; 55: 306-319. Villemagne VL, Mulligan RS, Pejoska S, et al. Comparison of 11C-PiB and 18F-florbetaben for Abeta imaging in ageing and Alzheimer's disease. Eur J Nucl Med Mol Imaging. 2012; 39: 983-989. Aizenstein HJ, Nebes RD, Saxton JA, et al. Frequent amyloid deposition without significant cognitive impairment among the elderly. Arch Neurol. 2008; 65: 1509-1517. Barthel H, Schroeter ML, Hoffmann KT, et al. PET/MR in dementia and other neurodegenerative diseases. Semin Nucl Med. 2015; 45: 224-233. Herholz K, Ebmeier K. Clinical amyloid imaging in Alzheimer's disease. Lancet Neurol. 2011; 10: 667-670. Yotten RA, Doshi J, Clark V, et al. Memory decline shows stronger associations with estimated spatial patterns of amyloid deposition progression than total amyloid burden. Neurobiol Aging. 2013; in press. Thiel A, Cechetto DF, Heiss WD, et al. Amyloid burden, neuroinflammation, and links to cognitive decline after ischemic stroke. Stroke. 2014; 45: 2825-2829. Maruyama M, Shimada H, Suhara T, et al. Imaging of tau pathology in a tauopathy mouse model and in Alzheimer patients compared to normal controls. Neuron. 2013; 79: 1094-1108. Small GW, Bookheimer SY, Thompson PM, et al. Current and future uses of neuroimaging for cognitively impaired patients. Lancet Neurol. 2008; 7: 161-172. Spillantini MG, Goedert M. Tau pathology and neurodegeneration. Lancet Neurol. 2013; 12: 609-622. Scholl M, Lockhart SN, Schonhaut DR, et al. PET Imaging of Tau Deposition in the Aging Human Brain. Neuron. 2016; 89: 971-982. Sepulcre J, Schultz AP, Sabuncu M, et al. In Vivo Tau, Amyloid, and Gray Matter Profiles in the Aging Brain. J Neurosci. 2016; 36: 7364-7374. Drzezga A, Barthel H, Minoshima S, et al. Potential Clinical Applications of PET/MR Imaging in Neurodegenerative Diseases. J Nucl Med. 2014; 55: 47S-55S. Chiotis K, Saint-Aubert L, Savitcheva I, et al. Imaging in-vivo tau pathology in Alzheimer's disease with THK5317 PET in a multimodal paradigm. Eur J Nucl Med Mol Imaging. 2016; 43: 1686-1699. Copyright: ©2018 Heiss WD. This article is distributed under the terms of the Creative Commons Attribution 4.0 International License.